Religious leaders need to listen to one another, and they must teach their followers to do the same, Pope Francis told four imams visiting from Great Britain. "The most important work we must do today among ourselves and with humanity is the work of 'the ear': listening. 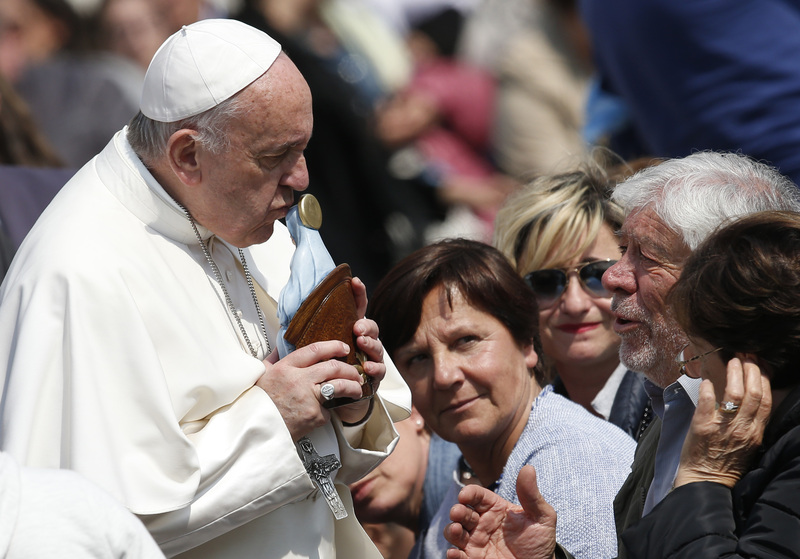 Listening to one another without hurrying to give a response," he told the Muslim leaders, who were visiting Rome with Cardinal Vincent Nichols of Westminster. "It's interesting," he said during the meeting on April 5, "when people have this ability to listen, they speak softly, tranquilly. But when they don't have it, they speak loudly and even shout." Religious people must listen to one another and speak to each other as brothers and sisters, he said. "Listen and speak softly, peacefully, seeking the path together." Pope Francis asked "almighty and merciful God" to bless the imams, and he asked the imams to pray for him. While Pope Francis was meeting the Muslim leaders, Egyptian Jesuit Father Samir Khalil Samir was meeting with reporters to discuss the history and current state of his homeland, particularly looking at the influence of Islam on the country and on Christian-Muslim relations. Islam, he told reporters, is experiencing "the strongest crisis the Islamic world has faced for centuries" with Islamic State, the Muslim Brotherhood and other minority currents trying to "Islamize" countries throughout the Middle East and North Africa. "The vast majority of Muslims are opposed to what we are seeing, all these inhuman crimes," Father Samir said. Asked about Pope Francis' trip to Egypt, which is scheduled for April 28-29, and particularly about its potential impact on Catholic-Muslim relations, Father Samir said: "The pope comes from Argentina. He doesn't know Islam, he only knows one very nice imam," who traveled with him to the Holy Land in 2014. "In my opinion, his lack of knowledge about Islam does not help dialogue." Father Samir said he had spoken privately to Pope Francis about remarks the pope has made affirming Islam as a peaceful religion and the Quran as a holy book promoting peace. The Jesuit said that while most Muslims want peace, he believes "you cannot read the Quran and pretend it is a book whose orientation is toward peace." Pope Francis, he said, told him he wants to improve relations with Muslims and was especially keen to re-establish friendly relations with the grand imam of al-Azhar University in Cairo, an institution with great influence on Sunni Muslim thought and practice. Pope Francis is scheduled to visit the university and speak at a peace conference it is sponsoring. Father Samir said meetings and conferences are the only avenues to dialogue and peaceful coexistence, but Christians must be honest enough to challenge Muslims who promote a literal reading of the Quran or believe it is possible for their nations to go back to living the way the first companions of Muhammad lived. Still, Father Samir said, "with his open attitude" Pope Francis has improved relations with Sheik Ahmad el-Tayeb of al-Azhar and that, in turn, has "helped el-Tayeb to be more open."